A panel discussion the other day focussed on Star Wars costuming clubs and how to make costumes. Taking place as part of the Long Beach Comic Expo, the panel discussion was moderated by Derek Easley and featured Robb Yanagihara, Ingrid Moon, Gabe Flores, Randy Figueroa, and Ryan Trent. 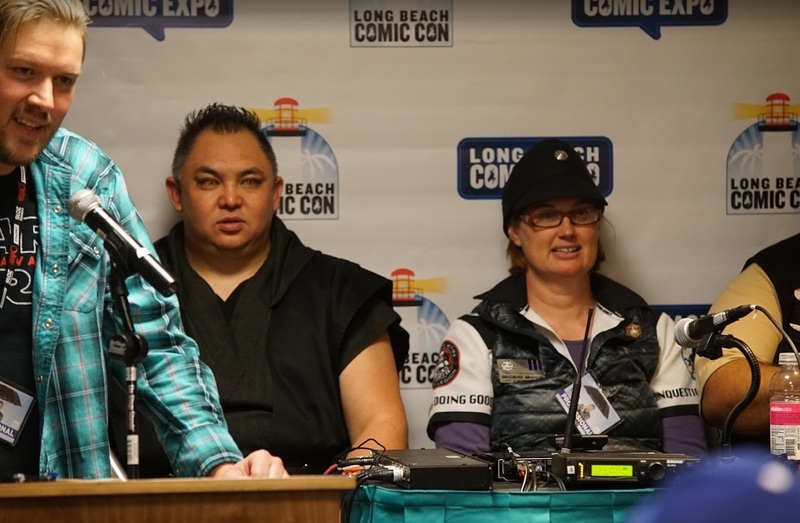 The panelists came from different Lucasfilm-recognized costume clubs, with Yanagihara in the Saber Guild, Moon and Figueroa in in the 501st Legion, Flores in the Rebel Legion (although he is also a member of the 501st Legion), and Trent in the Mandalorian Mercs. The panelists all enjoy the primary element of these costuming clubs, on account of the charity work they do. “I got into it because of the charity work,” said Flores, and, he said, it is “great meeting new people.” Yanagihara said that all the hot nights and spinning around and training “makes those experiences worth it” with Make-A-Wish kids. 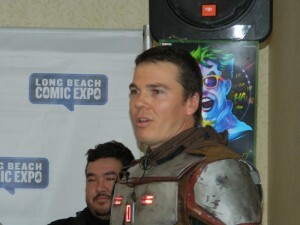 As to the characters and costuming, Figueroa said the 501st Legion covers all of the bad guys. Trent says the Mandalorian Mercs are the third-largest of the Lucasfilm-licensed costume clubs, although the Mercs “gives you more freedom in how you want to express yourself” than the others. He, for instance, “built everything from scratch”, although he bought the undersuits for his costuming. “With the canon groups, you have to be very particular”, said Figueroa, although he did note that there is more leeway with the Mercs. Moon said that “what’s also important abou the canon costumes is proportions”, meaning that the costume is proportionate to one’s body. 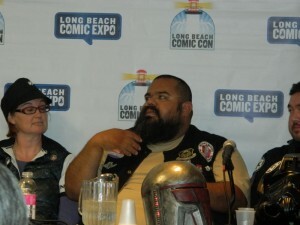 Flores said that, in the Rebel Legion, one can still dress up as characters from Star Wars Legends, even though they are now not canon. 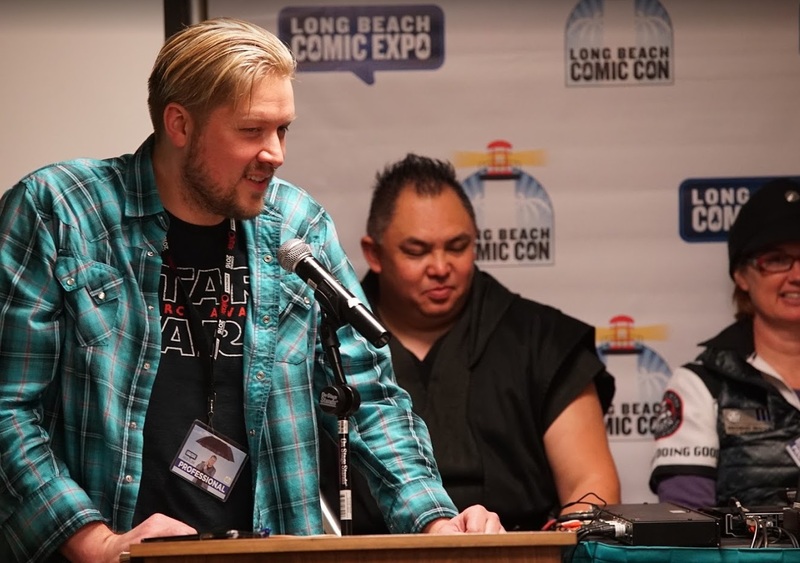 Yanagihara said the Saber Guild is pretty simple, as they try to keep their Jedi characters in the Clone Wars era with brown and tan outfits. However, he noted, both Jedi boots and Sith boots can be hard to find. “We do a lot of shows for kids, so you have to look the part,” said Yanagihara.